Her position will instead be defined in a “transparency charter,” which is currently being drafted and will be made public “very shortly,” an Elysée spokesman said. The source said: “Mrs Macron, the head of state’s wife, will not have a political role, but a public one. Both announcements came hours after it had emerged that a petition launched on change.org to prevent Mrs Macron from being given a specific status had garnered more than 240,000 signatures in just two weeks. 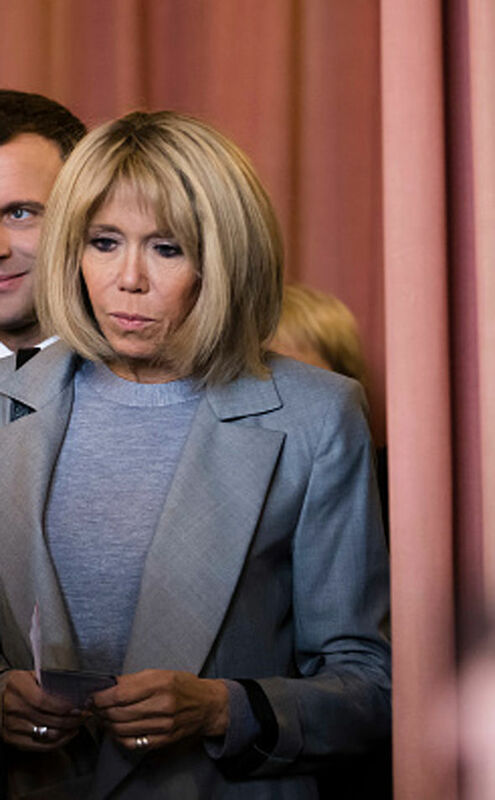 Unlike the US first lady, the French equivalent does not have a formal role, although she often becomes a charity champion and has a small team working for her at the Elysée presidential palace. 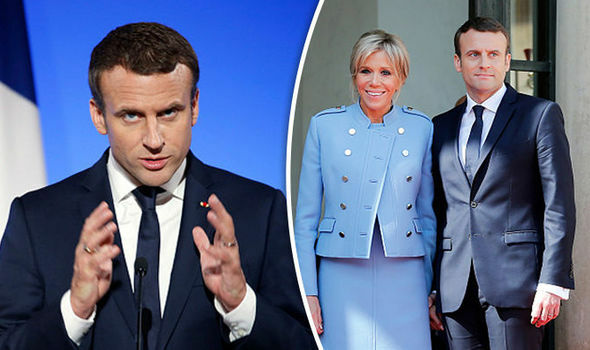 During his whirlwind campaign Mr Macron pledged to “clarify” the role of first lady by giving them an official role, describing their current status as a “kind of French hypocrisy”. 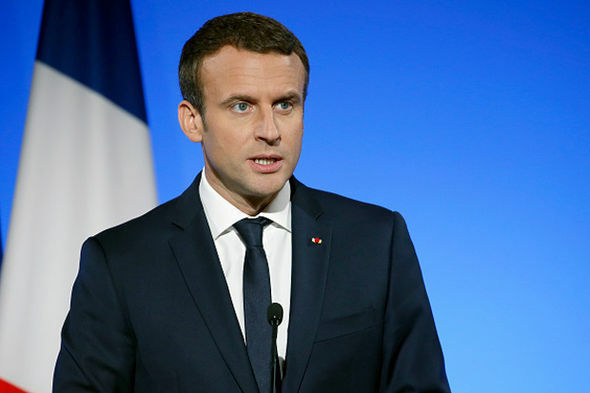 His plans, however, quickly backfired, with critics saying that, at a time when government is slashing public spending and attempting to “moralise” public life by banning MPs from hiring family members as their assistants, the French could not approve of plans to give their first lady a specific status. Brigitte Trogneux: A high school teacher and the wife of the French politician Emmanuel Macron. Mrs Macron, who receives about 200 letters a day, already has a staff of four. If you don't believe me, all you need to do is read what Flip wrote on http://stophomework.com/ interview-with-kerry- dickinson-a-california-parent- who-successfully-changed- homework-policy-in-her- district/1322 She said "Raised 6 kids. Teachers get too settled in behind their desk. Same assignments year after year. For Example. My 5th grader had a 10th grade SAT score. The School board was going to hold him back because he had an F for homework grades. They passed him to 6th. The 6th grade told him if he would do his homework they would pass him to 7th midterm. The child did not. By 7th&8th grade we had monthly teacher(s) meeting with 7 teachers, me and the boy. No one could understand why he had passing Test Scores but F in Homework. This kid loved to read, but not what they assigned him. Why should kids read only the material the teachers like to read? They placed him in Remedial classes (special education for slow learners) He hated school. I eventually had him home schooled where he dropped out in the 10th grade. " As you can see this belief is firmly ingrained in our local communities and society as a whole. Some of you may be wondering why does everyone believe in assigning homework if we say it's so bad. Well let’s just take a second and back up. Why is homework assigned to begin with? Homework has held its spot in educational philosophy due to the common belief that it promotes responsibility and a better student. However, responsibility is often confused with obedience, as students are being forced to do homework. So far studies and surveys have only ever proven that homework for children in elementary school does more good than bad, in middle school anything over an hour becomes counter-productive, and in high school anything past two hours doesn't hold any benefit to the student. The college of education at the for-profit University of Phoenix recently took a poll asking Harris Poll to survey teachers about the hours of homework they require and why they assign it. The pollsters talked to 1,005 teachers in public, private, and parochial schools across the United States, a group designed to be a representative sample of the nation's 3.7 million teachers. High school teachers interviewed said they assign an average of 3.5 hours worth of homework a week. For students who study five days a week, that's 42 minutes a day per class, or 3.5 hours a day for a typical student taking five classes. Middle school teachers (grades 6-8) assigned roughly the same amount: 3.2 hours of homework a week, or 38.4 minutes a day per class. That adds up to 3.2 hours of homework a night for a student with five classes. K-5 teachers said they assigned an average of 2.9 hours of homework each week.I personally surveyed my school and found that on average people said they had 2 hours worth of homework every night, or about 100 minutes worth. The data reflects what anecdotally shocks many parents: homework loads jump in middle school, right when kids need the most sleep to grow and develop. The things they found too much homework leads to are: increased stress, let’s grades slip more easily, leads to sleep deprivation, and steers the students’ interests away from the subject in question. In fact, kids who do 60 to 90 minutes of homework in middle school and over two hours in high school actually do worse than average on standardized tests. When asked, the teachers who participated in the poll said they assigned homework for three reasons: to see how well students understand lessons, help students develop essential problem-solving skills, and show parents what's being learned in school. The worst part about that? Worksheets that teachers assign don't help with developing these skills. And assigning homework EVERY night just to show it the student's parents? Why not just have a quiz once a week over the subject you cover? Just 30 percent of teachers chose covering more content as one of their top reasons for assigning homework. So why do people still insist on implementing it? Why do teacher, parents, and society as a whole all believe in assigning homework? The answer is that there are 5 common beliefs that everyone still believes in. Most teachers provide homework because they believe that it can raise grades, promote responsibility and improve time management, also they believe that practice is necessary to reinforce the teacher’s lesson from the day. Then there is the 2002 Federal "No Child Left Behind,", which pushed States and then schools to higher standards and increased performance on standardized tests, leading to an increase of academic pressures on teachers, schools, and students. If teachers don't assign homework, they lose their job. Teachers are also pressured by the school to assign homework because the schools earn bonus money based on how good their students' test scores are. Of course if we listen to Ed Week, homework does not help the students' grades on tests. These beliefs are the main reason for people to assign homework, but not only are these beliefs just incorrect, they also lead to a destruction of the student's afternoons and healthy habits. Belief #1: The role of the school is to extend learning beyond the classroom. Many believe it is not only the inalienable right of teachers but their obligation to extend learning beyond the classroom. Inherent in this belief is the assumption that teachers have the right to control children's lives outside the school—that we have the right to give homework and that students and parents should comply with our wishes. Many teachers claim that homework keeps children out of trouble and that homework is better for children than television or video games. This view is rather dismissive of the judgment of parents to make good decisions about their child's use of free time. Is it really our job to be the moral policeman for our students' personal lives? Perhaps our role in extending learning outside the school is to instill in students the value of learning and the joy of learning, and to expose them to the vastness of the universe—how much there is to learn. Perhaps our role is to help students find something in life they feel passionate about and to help them find their purpose in society. Belief #2: Intellectual activity is intrinsically more valuable than nonintellectual activity. Many homework advocates believe that intellectual development is more important than social, emotional, or physical development. Intellectual pursuits hold an implied superiority over nonintellectual tasks such as throwing a ball, walking a dog, riding a bike, or just hanging out. This belief presupposes the limited value of leisure tasks. Concurrently, some worry that too much unstructured time might cause children to be less successful, less competitive with others. As with Belief #1, this view shows a distrust of parents to guide children in the productive use of free time and a distrust of children to engage in intellectual pursuits on their own. In reality, physical, emotional, and social activities are as necessary as intellectual activity in the development of healthy, well-rounded children. Belief #3: Homework teaches responsibility. One of the most resilient beliefs is that homework promotes responsibility and discipline. Even though there is no research to support this belief, many people continue to tout homework's nonacademic virtues (Kohn, 2006). Responsibility is often a code word for obedience. When we say we want students to be responsible, are we saying we want them to beobedient—to do what we want them to do when we want them to do it, to be mindless drones, blindly obedient to authority? One teacher said she thought not doing homework was a sign of disrespect for the teacher! When we say homework promotes discipline in students, does that mean being self-disciplined enough to do something they hate to do because it's their duty? Many teachers are fixated on homework as the way to teach responsibility, as though we have no other avenues. Yet we tend to neglect all the other ways students could be given responsibility in the classroom—involving them in decision making about their learning, teaching them how to self-assess, letting them design learning tasks, or allowing them to help manage classroom and school facilities (Guskey & Anderman, 2008). Even in the task of homework itself, children are rarely given responsibilityfor choosing how they wish to learn, how they might show what they have learned, or how they might schedule their time for homework. True responsibility cannot be coerced. It must be developed by allowing students power and ownership of tasks (Vatterott, 2007). (Chapter 4 presents more about how to do this.) Another supposed virtue of homework is that it teaches time management. Does time management really mean the ability to delay gratification—to work when we want to play? Homework does not reinforce time management if adults have to coerce children into doing it; if children are coerced, they are not in charge of scheduling the time or making decisions about the use of the time. If we are using homework to teach responsibility, won't 10 minutes of homework work just as well as 60 minutes? If we are using homework to teach time management, don't long-range projects that require scheduled planning do a better job of that than daily assignments? Belief #4: Lots of homework is a sign of a rigorous curriculum. Many people equate lots of homework with a tough school, regardless of the type or length of assignments (Jackson, 2009). Parents will often brag: "My child goes to a really good school—he gets lots of homework." If the mind is a muscle to be trained (as was believed in the 19th century), then more work must equal more learning. If some homework is good for children, then more homework must be even better. If 10 math problems for homework are good, then 40 problems must be better. This belief, more than any other, is responsible for the piling on of hours of homework in many schools today. Yet we all know that those assignments could be busywork, of no educational value (Jackson, 2009). More homework gives theappearance of increased rigor, and "difficulty is often equated to the amount of work done by students, rather than the complexity and challenge" (Williamson & Johnston, 1999, p. 10, emphasis added). Ah, if it were only that simple. More time does not necessarily equal more learning. The "more is always better" argument ignores the quality of work and the level of learning required. Rigor is challenge—but it is not necessarily the same challenge for each student. Given the diverse nature of students, challenging learning experiences will vary for different students. Belief #5: Good teachers give homework; good students do their homework. Probably the most disturbing belief is the belief in the inherent goodness of homework, regardless of the type or length of assignment. Homework advocates have believed it for years, never questioning whether it might not be true. This belief is born from both the belief that homework teaches responsibility and discipline and the belief that "lots of homework" equals "rigor." If good teachers give homework, it naturally follows, then, that teachers who don't give homework are too easy. This mindset is so ingrained that teachers apologize to other teachers for not giving homework! Yet we know that some very good teachers don't give a lot of homework or give none at all. Instead of being apologetic, teachers who don't give homework should simply explain that they do such a good job of teaching that homework is not necessary. The danger in the belief that good students do their homework is the moral judgment that tends to accompany this belief. To children who dutifully complete homework, we often attribute the virtues of being compliant and hardworking. To children who don't complete homework, we often attribute the vices of laziness and noncompliance. But is a lack of virtue the reason many children don't do homework? Therein lies the problem. Students without supportive parents (or with single parents overburdened trying to make ends meet), with inadequate home environments for completing homework, or with parents intellectually unable to help them are less likely to complete homework (Vatterott, 2007). Are these less advantaged students bad? Of course not. These beliefs form a dogma, a homework culture. The foundations of that culture are a trinity of very old philosophies. Homework culture is a complex mix of moralistic views, puritanism, and behaviorism. The beliefs that underlie the homework dogma have been fed by our moralistic views of human nature, the puritan work ethic that is embedded in our culture, and behaviorist practices that still reside in our schools. The five beliefs and these three philosophies are so well entwined, it's hard to tell where one idea begins and another ends. An exploration of these philosophies will illuminate the foundations of the dogma that is homework culture. Now some of you may be going "Well I did homework when I was in school, it wasn't that much." and "Oh, it wasn't that bad." Well, a recent study shown on "The Race to Nowhere" shows the amount of homework assigned to kids from 6 to 9 almost tripled between 1981 and 1997. This amount continues to increase leading to the average assigned homework for a week increasing from about 44 minutes a week to more than 2 hours a week in the space of just 16 years! Then homework for kids aged 9 to 11 increased from about 2 hours and 50 minutes to more than 3 and a-half hours per week. Just think, these are third and fourth graders sitting still writing math problems for 3 HOURS! When we don’t have homework, it’s almost thought that we aren’t working to be smarter to those people. I will never forget what Mrs. Causey, our very own counselor said to me, “I wouldn’t want to work for a school where the students didn’t work hard and do their homework to achieve academic success.” These very words told me exactly how ingrained these common beliefs are in our society and our school system. They all believe that homework is essential, and this is exactly what needs to change because this hurts not only the students but their parents as well. Homework squeezes family life. All parents have educational agendas for their children. They want to pass on their cultural heritage, religious beliefs, and important life skills. They want to teach their children how to be good citizens and how to share in the responsibilities of running a home. More homework makes parents put their own agendas on hold even as they often struggle to help their children cope with homework assignments. Additionally, families need time to constitute themselves as families. According to a 1998 survey by Public Agenda, nearly 50 percent of parents reported having a serious argument with their children over homework, and 34 percent reported homework as a source of stress and struggle. Parents often have conflicting feelings about homework, viewing it as a way for their children to succeed but also as imposing serious limits on family time. On top of all that, most every student has some extracurricular activity, which they need time to practice, train, and work at. I surveyed my school, and found that only 1 in 100 students DON'T have extra-curicular activities, and most everyone has more than 1. On top of that, their activities lasted 1-3 hours every night! How many adults could juggle projects and papers given to them to complete AFTER their 9 hour work day; come home, and then go to 2 2 hour sessions to learn things not taught or covered, and then still manage to do all that work and help out in their family? If you work every student at this schedule, they won’t be able to keep it up. They won't have any life skills or hobbies for them to use or enjoy. Part of growing up is learning your interests and what you're good at. How can you do that while stuck doing homework? There is no time for play, family activities, or learning what you're good at. It all becomes centered around school. This is not something that should happen. In fact, Clackamas High School principal Matt Utterback and the teachers at Clackamas High are approaching homework differently. They’re not grading it. In which case, why assign it? If you assign students homework to do during THEIR afternoon and then don't even look over it to see if they did it right, is that not their afternoon they spent working on it wasted? The whole reason homework is supposed to be assigned is to reinforce and to clarify the day's teaching, so if you don't look at it and tell the students what their mistakes were, what is the point of doing it? If there is no point in assigning it then why assign it in the first place. If the teacher's hate it, the students hate it, the families hate it, and it doesn't do any good, then why assign it? The effects of homework are so detrimental to students both emotionally and physically. In fact, a recent study shows the number of 7 to 17 year old's who visited the doctor for depression more than doubled from 1995 to 2002, when 3.22 million children were treated. This was during the same years that homework levels were increased. In fact, one in three American children suffers from depression and over 25% of adolescents have felt sad or depressed every day for 2 or more weeks at least once during a year's time. By age 15, however, girls are twice as likely as boys to have experienced a major depressive episode.which is up from the 1980's before they started increasing homework. Another nationwide survey of youth in grades 9-12 in public and private schools in the United States found that 15% of students reported seriously considering suicide, 11% reported creating a plan, and 7% reporting trying to take their own life in the 12 months preceding the survey. This just goes to show how much homework drags on our nation. An article on suicide by EMPS states "Suicide rates, for 15-24-year-olds, have more than doubled since the 1950’s, and remained largely stable at these higher levels between the late 1970’s and the mid-1990’s." Now suicide is the third leading cause of death for 15-24 year. In fact in the United States, a young person commits suicide every two hours. Homework has changed the student's, the teacher's, and the families of America's lives for the worse and prohibits and hinders the ingenuity and passion of our generation. With the time we could be using to play or read, we instead spend inside working the same math problems and equations over and over. If you want us to practice our skills, to reinforce the valuable skills we learn in the classroom, let us live our life. Let us live and call upon those skills when we need them in real life, where the work we do actually has a point. Let our passion to learn new things be found by ourselves. You cannot teach passion, so give us the chance to find our own. Homework cannot reinforce what the teachers teach, teach responsibility, make you time manage, or make you “smarter.” Only living and personal experience can truly do that, and we cannot experience anything while stuck inside, doing the same thing over and over again. If Isaac Newton had had homework, he’d have never seen the apple fall. If Galileo had had homework, he'd have never seen the stars. If Aristotle had had homework, he'd have never started to question life, science, or math. Maybe the reason our parents went to the moon, invented the microwave, the satellite, the fridge, the A/C unit, the radio, the TV, recorded video, the polio vaccine, and the millions of other major steps for mankind that have forever changed our life is not because they're smarter, but because the students had the time and opportunity to find their own interests and passions that they continued to pursue. Just think of what the 1.8 BILLION kids in school could find and discover if they had but the time to do it. Sign this petition to join me in making homework voluntary. Doing this would allow students to get in practice on what they think they need practice on and it allows them to learn time management, have responsibility, and would allow the student to spend more time learning skills and spending time with their family, not in their room doing homework. They would be able to work on what they need to work on, and make sure they were doing it right the next day. This also allows a student to plan their own schedule, a valuable life skill, and they would learn how to be responsible. The student's love of learning would grow with the absence of repetitive homework over things they already know and do, and they would be able to pursue their own interests, help out with their family chores/responsibilities, and grow up in a healthy way without homework. Help me create this change! After signing this petition spread the word. Demand change. Tell your teachers and your parents. Approach the PTA and talk to them about this. Talk about this at your next school board's meeting. Together we can take down homework as a mandatory monster and change it for good. We must make homework voluntary. Do not let homework continue to hinder our nation's ingenuity, stop it before it stops us. If you are still not convinced about our nation's plight, all you need to do is read the articles on the below website. To see my full argument and more back up and proof, visit http://tigerathlete.wixsite.com/ban-homework .